ASTANA, Kazakhstan, Sept. 7, 2018 /PRNewswire/ --The "One Belt, One Road" China-Kazakhstan Intelligence Media Forum is being held in Astana, the capital of Kazakhstan, on September 7, 2018, bringing together representatives from the Chinese and Kazakhstan governments, as well as policy institutes, media outlets and companies from the two countries. At the Forum, attendees discussed how to strengthen cooperation and promote cultural exchanges between the two countries. 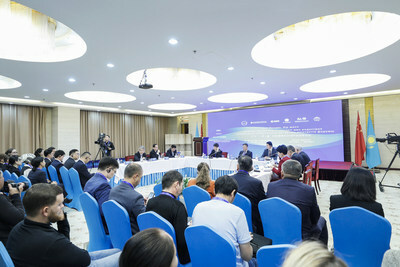 The Forum was co-hosted by the China Public Diplomacy Association, the International Relations Committee of Kazakhstan and International Secretariat of G-Global, and co-organized by huanqiu.com and the Confucius Institute at Eurasian University with Infinitus (China) Company Ltd. serving as the sole sponsor. 2018 marks the fifth anniversary of the launch of China's "One Belt, One Road" initiative, of which cooperation in healthcare has been a key component. The Forum included the China-Kazakhstan Health Culture and Industry Cooperation Sub-forum, a key topic of which focused on how Chinese manufacturers of traditional Chinese medicines implement their international strategies and establish meaningful collaborations with likeminded organizations in Kazakhstan. 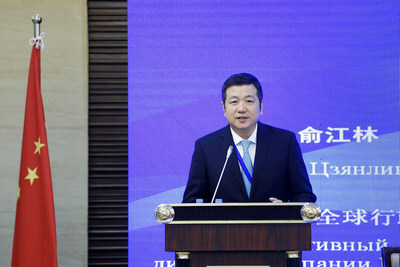 "Currently, traditional Chinese medicine (TCM) is playing an important role in propelling mutual learning between eastern and western civilizations among the countries along the route of the Belt and Road initiative, " said Mr. Wu zhendou, Deputy Director of the International Cooperation Department of the State Administration of Traditional Chinese Medicine of PRC. "It is also becoming an important platform for China and countries along the route to jointly safeguard world peace, enhance human well-being and build a community of shared future for mankind." Mr. Lam Yu, Senior Vice President of LKK Health Products Group, Managing Director of Infinitus Global, Vice Chairman and Managing Director of Infinitus (China) Company Ltd., said in his keynote speech, "The global medicine industry has shifted its focus from treatment to prevention, in line with the basic philosophy of traditional Chinese medicine (TCM) which, from its origins, has always advocated that 'preventing the disease from occurring and worsening is more important than treating a patient already diagnosed with the disease'. When it comes to addressing global health issues, the benefits of TCM, Chinese herbal medicine and health preservation, long a cornerstone of TCM, are increasingly being shown to be an approach with tangible results and worth considering as a solution to the health issues that continue to plague our great planet." As a leader in the Chinese health sector, Infinitus plans to set up a branch in Kazakhstan within this year. The company has expanded its presence into Canada, Chinese mainland, Hong Kong, Malaysia, Singapore, Taiwan and Thailand, among other countries and regions. Backed by partnerships with leading global universities and colleges as well as scientific research organizations, Infinitus has the capacity to supply products valued at over 50 billion yuan (approx. US$7.5 billion) annually and continues to claim a leading position in terms of market share worldwide. Mr. Lam Yu added, "Infinitus is willing to provide health solutions to countries along the Belt and Road route and hopes to play a key role in expanding cultural exchanges and partnerships in health between China and Kazakhstan. We will continue to help create an environment for the two countries focused on mutual promotion and development through cooperation, innovation and experience exchange. By doing so, we expect to address the health needs of the people of Kazakhstan, create new job opportunities, boost local economic and social development, as well as deliver the opportunity for the people of Kazakhstan to lead balanced, affluent, harmonious and healthy lives." Infinitus (China) Company Ltd., founded in 1992 and headquartered in Guangzhou China, is a member of LKK Health Products Group. The Company focuses on R&D, production, sales and services of Chinese herbal health products. It has set up 30 branches and 30 service centers together with over 7,000 exclusive stores on the Chinese mainland.